As a family, we love fruit – mixed into oatmeal in the morning, sliced and diced for snacking, topped with ice cream or in a tart for an indulgent dessert, arranged prettily in a bowl for general munching. We usually chop two big freezer bags full of it for airplane rides, too. 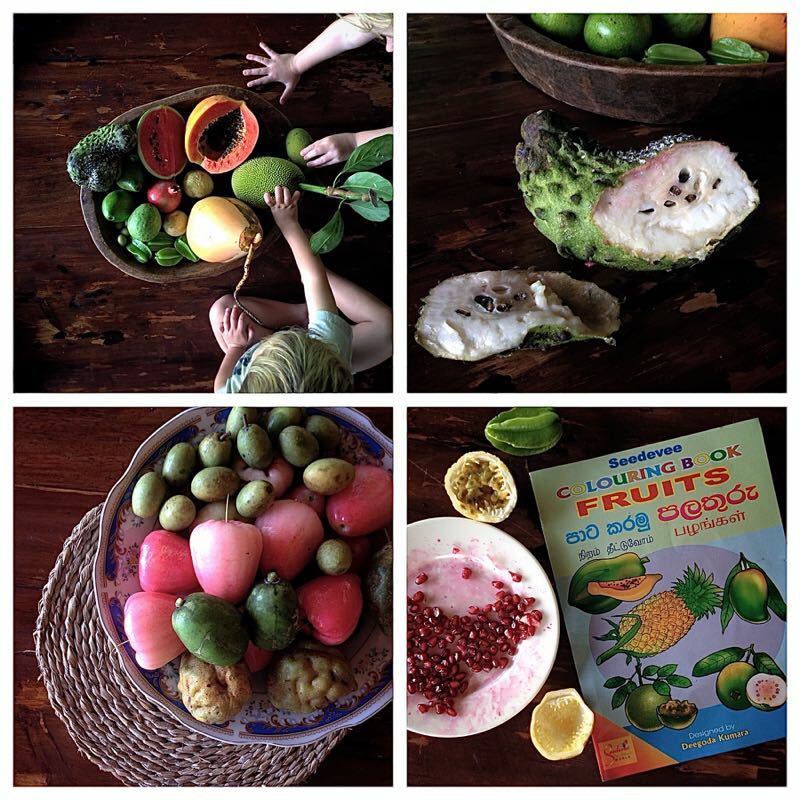 Before we arrived in Sri Lanka, we considered ourselves fruit experts. Sri Lanka has taught us we have a lot left to learn! We love the tropical fruit salads we’ve been having with breakfast – pineapple, papaya, mango, banana, and watermelon. These are all fruits we’ve enjoyed in the past, although they are particularly fresh and delicious here. But as we sped by a fruit stand in the tuk tuk the other day, I realized I didn’t recognize several of the items being sold. 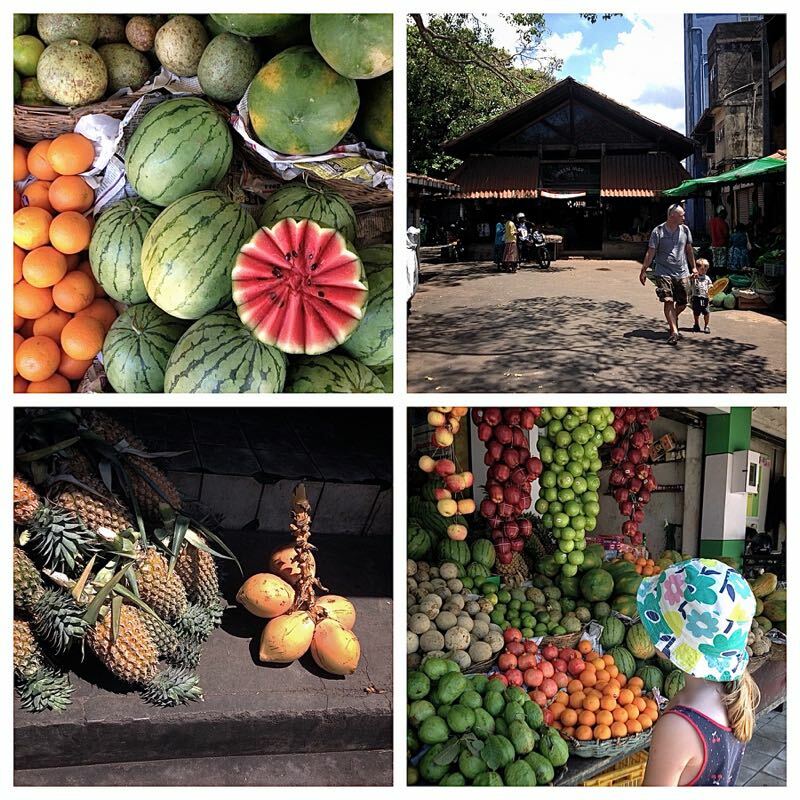 I set a goal to learn more and try as many Sri Lankan fruits as we could find. For the past two days that has been our (delicious!) mission. Yesterday we went to the fruit market and we also asked the amazing cook in the house where we’re staying to help us source any and all fruit (he arrived this morning with a plateful of fruit, all picked from trees on his way from home!). *Jackfruit – I still don’t quite understand the difference between jackfruit and breadfruit and we’ve seen both here in the trees. Jackfruit seems to be used almost as a vegetable and tastes a bit like roasted chestnuts when cooked. *Jambu (Water Apple/Syzygium) – sort of like a cross between an apple and a radish or like a really light and watery apple with a rose flavor; the smaller ones are especially light, juicy, rosey, and delicious! *King coconut (Thambili) – we cut it and drank the juice and it was amazingly refreshing; now I understand why there are so many thambili kiosks along the roads! *Nanan – we haven’t quite managed to find the English name for this, but I want to because it’s delicious! It looks a bit like a small green shriveled brain on the outside and the inside flesh is a bit like a pear. Papaya – between Fiji and now Sri Lanka, I think red papaya is my new obsession; I just can’t get enough! We’re still looking out for cashew apple, mangostin, rambutan, and sapodilla. And also for atemoya and sweetsop (which are closely related to the annona muricata/soursop we’ve already tried). What a cool post Leah! 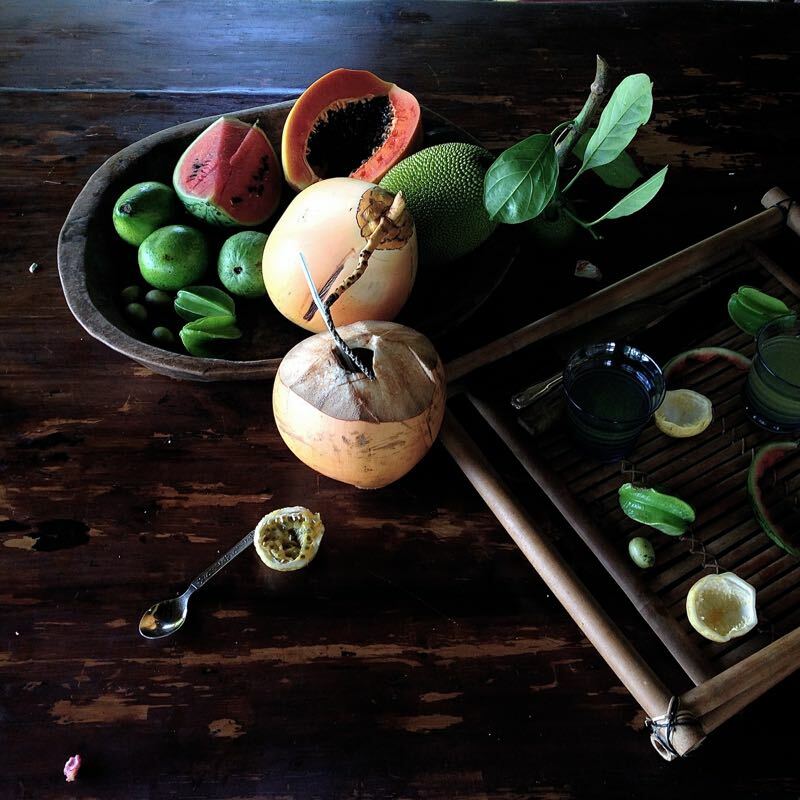 Most of these fruits we have in Brazil, I wish you could include Brazil in your trip, you would be also surprised with the variety of fruits you can find there. The funny thing is that you said that jack fruit is used as a vegetable. In Brazil we have jackfruit and it tastes so sweet ( it has a sead in the middle) and bread fruit that is a bit sour, we use it cooked( the texture when cooked is similar to cassava). Hope you try thousand more fruits… Love to you all. Leah, it sounds like you found now. That “being in an experience” became as important or more important than reporting “from” an experience. And from that place you really can choose (a deep discerned choice you fully own) when to hAul out a “real” camera vs no camera vs iPhone! Well played lady, well played!